We design and fabricate new shell and tube heat exchangers, as well as direct replacement and duplicate exchangers. Built to ASME Section VIII, Division 1 requirements with 100% traceability, as well as per TEMA B, C, & R standards, all of our heat exchangers are constructed in-house, so you are assured of the quality performance you expect. We have helped our customers solve difficult fluid flow, heat transfer and corrosion problems with sophisticated material selection and creative fabrication designs. Our standard tube wall thickness selected is .049 (18 BWG). This is to provide our customers with a product that will last longer. Not only does this thickness meet our pressure and temperature ratings based on A.S.M.E. Code Calculations, it exceeds it. This results in a tube bundle with a greater expected life than the .035 wall (20 BWG) tubes used by many of our competitors. We do not believe in planned obsolescence! Specialty high alloy and corrosion resistant materials are available. With over 20 years of experience in the replacement tube bundle industry, we have accumulated a large database of dimensional data and materials of construction for other manufacturers' makes and models. Contact us with your current make and model number, and we will cross reference it. Standard tube bundles ship 2 weeks after receipt of order and verification of dimensional data. Standard heat exchangers ship 5-6 weeks after receipt of purchase order and final drawing approval. Rush and Emergency shipments of 5 work days, 2 work days, and 24 hours are available. All of our tube bundles are hydrostatic pressure-tested and verified by an authorized Quality Control Inspector prior to shipment. A cope of the Certification of Test is included with the shipment. MTRs are available upon request. ASME Stamps and Partial Data Reports are also available - please request them at the time of your inquiry. We also offer Double-Wall Vented Leak Detector Tube Bundles for domestic hot water and other applications where avoiding cross-contamination of the heat transfer media is critical. Please contact us for more information. 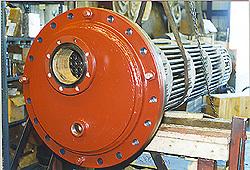 Ship your existing heat exchanger to us for a diagnostic and we will advise on how to proceed. Freight and inspection fees may apply. Our Coils Carry ARI 410 Certification.